The first time I made these baked potato wedges, I was surprised how easy they are to put together and how deliciously crunchy they are. If you love potato, then this dish is a must try and what my strong belief is that it can turn even a non-believer into a fan. 2. Mix all the ingredients in a bowl and add potato wedges to it. Toss so that potatoes are well coated with the seasoning. 3. Spread potato wedges on a greased baking tray. Bake at 375 degrees F for about 35-40 minutes. Serve hot. 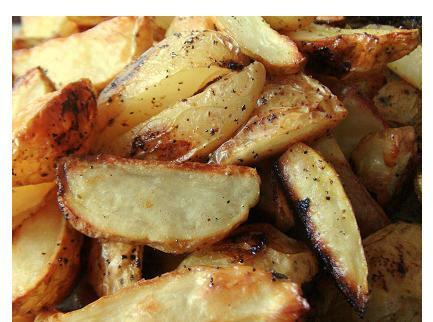 Note- for quick results, boil potatoes to 2 whistles and then cut into wedges.